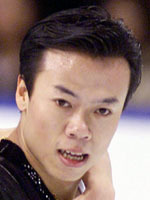 Born in Harbin in Mandchourie, like Shen Xue, Zhao began as an individual skater before switching to pairs, only for his partner to quit leaving the door open to link up with Shen, who is nearly five years younger. In 2002, they put a series of lower podium finishes behind them to finally win the world title, again at Nagano in 2002, thereby becoming China's first world champions in this discipine. They helped silence the critics the following year in Washington, successfully defending their world crown holding off Totmianina-Marinin and Russian pair Maria Petrova et Alexeï Tikhonov. Perhaps lack of competition took a toll as when seeking revenge at the Turin Olympics, they were only able to place third, just behiond rival Chinese couple Dan and Hao Zhang in 2nd and, way ahead on points, Totimania and Marinin in gold.